Decrease in baby blues & PPD (Post Partum Depression). Decrease iron deficiency or post partum anemia. Decrease insomnia and sleep disorders. 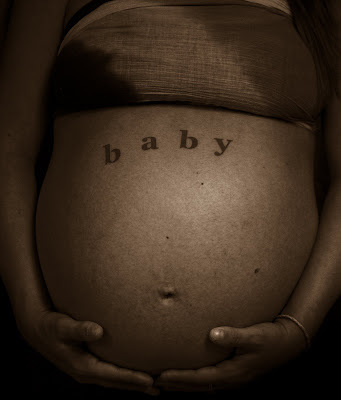 The placenta’s hormonal make-up is completely unique to the mother. 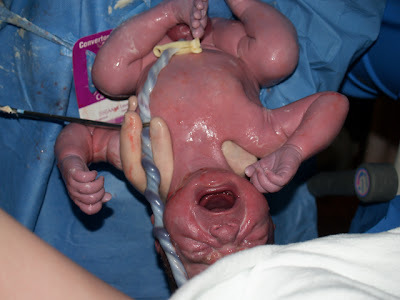 No vitamin, supplement or pill can equal what the placenta can do. Isn’t that pretty cool? It has also been reported to being made into a tincture to be given to the baby that it once supported during infancy and childhood for a variety of benefits. STEP 2. *Not for the squeemish* Place on cutting board and severe cord at base. It will likely bleed little bit. 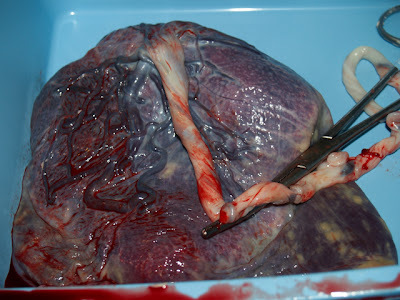 If you prefer to do the raw method you would thinly slice the placenta after you have cleaned it. Laying the slices on dehydrator trays(or in the oven), keeping the temp below 118F to preserve maximum nutrients and keep enzymes intact. STEP 4. Slice up placenta into thin strips at this point. 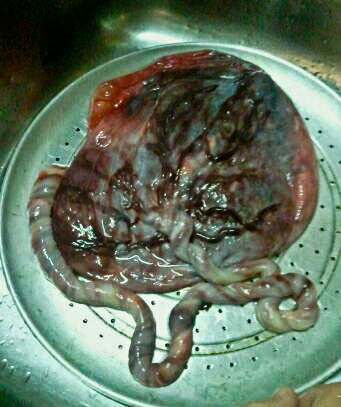 If you are using a low oven to dehydrate your placenta, set oven to lowest temp. It takes 12-24hrs to dehydrate depending on method used. It’s best to slice thin and keep them uniform in thickness and length so they dehydrate evenly. STEP 5. GRIND THE STRIPS.. 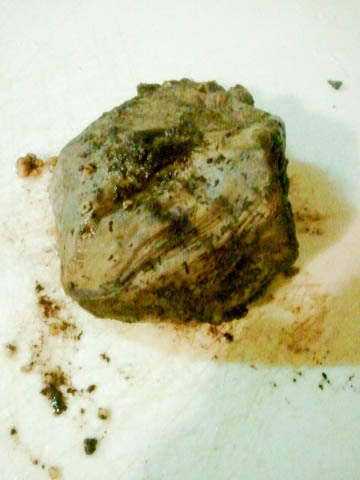 Using a strong grinder or processor, grind placenta strips. They are going to be very hard. You want to grind them down to a fine powder. You may want to break the dehydrated strips in half prior to grinding, actually I recommend this so you don’t break your grinder/processor which I have heard can happen. This is the time to add/mix in any familiar and beneficial dried herbs if desired. STEP 6. 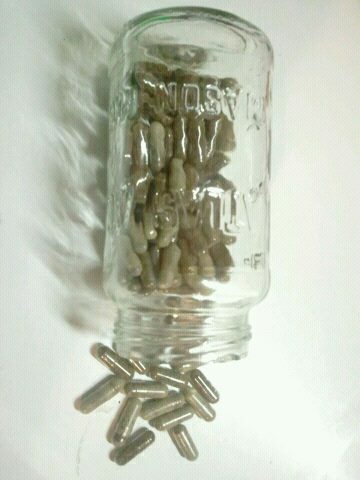 Fill capsules. One placenta will yield *about 125-175 capsules*. You can use equipment like The Capsule Machine but I have done mine by hand and it wasn’t too bad. A good capsule size is “00”.There are smaller size capsules available. This post is not medical advice and is not a substitute for seeing your health care provider. Taking a moment to honor this wonderful mama. She is anxiously yet very patiently awaiting her baby who is literally due to arrive any moment. The early signs of her body gearing up for birth began weeks ago, and as they continue to come more frequently she is dancing the journey with patience and grace. All of us moms who have been there know exactly how very normal, sometimes frustrating and exciting this moment can be. She is doing beautifully. To help pass the time we set up my camera and took some awesome shots. It’s been a busy month already. 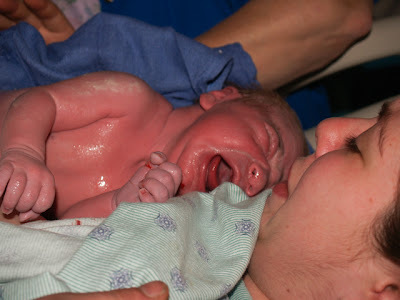 Myself and other doulas I know locally have been experiencing an increased trend of births lately. Babies and more babies being born one right after another since the Holidays. It is always an honor to share the space of birth with the families. Welcome to the world babies & Congratulations to all the families! Even the best diapering can still result with baby’s bottom being irritated. Cloth diapers is the best way to go for diapering and often more helpful in avoiding irritation. Cloth is breathable, chemical free and healthier for baby and the enviroment. Most powders and creams in the stores are full of ingredients that aren’t very healthy and the quality of these products is also lost. It’s important to remember the Integumentary system or “skin” is the largest organ in the body. It’s our defense barrier between the outside and is also a filtering system for substances entering and exiting the body. Our bodies do not like chemicals and our babies especially have delicate skin needs. Consider a quick and easy way to whip up a more friendly solution to diaper irritation. Home made Baby Powder Recipe A talc-free powder with some of nature’s finest herbs for gently soothing and to help heal irritated skin. 1 cup arrowroot powder 1 tbsp. dried ground chamomile 1 tbsp. dried ground lavender Combine all ingredients until evenly blended. Consider recycling a jar and poking holes to make a shaker. Use as needed externally applied to baby’s bottom when diapering. Arrowroot powder gently helps soothe and dry damp areas, lavender and chamomile are soothing, healing, and help prevent bacterial growth. A good old fashioned rolled oats bath can be calming is also helpful in soothing your baby’s skin. Put a cup of rolled (not instant) oatmeal in an old stocking or cheesecloth. Tie it up so you don’t end up with oatmeal mush all over your tub and add to hot bath water. Allow the water to cool down to an appropriate temperature before placing baby in the bath. Always double check the bath water with a thermometer insure it is safe and will not burn your loved one. Wishing your baby a happy bottom! Have fun making this simple, healthier, friendly alternative to talc baby powder! Just a friendly reminder to always remember to change your baby frequently to help prevent irritation from urine and stool. This post is not medical advice and is not a substitute for seeing your health care provider. Many diaper rashes are not serious, however rashes including those in the diaper area can signal a more serious condition. For really bad or unusual rashes or rashes that perisist without getting better, a visit to your doctor is highly recommended and should be considered.